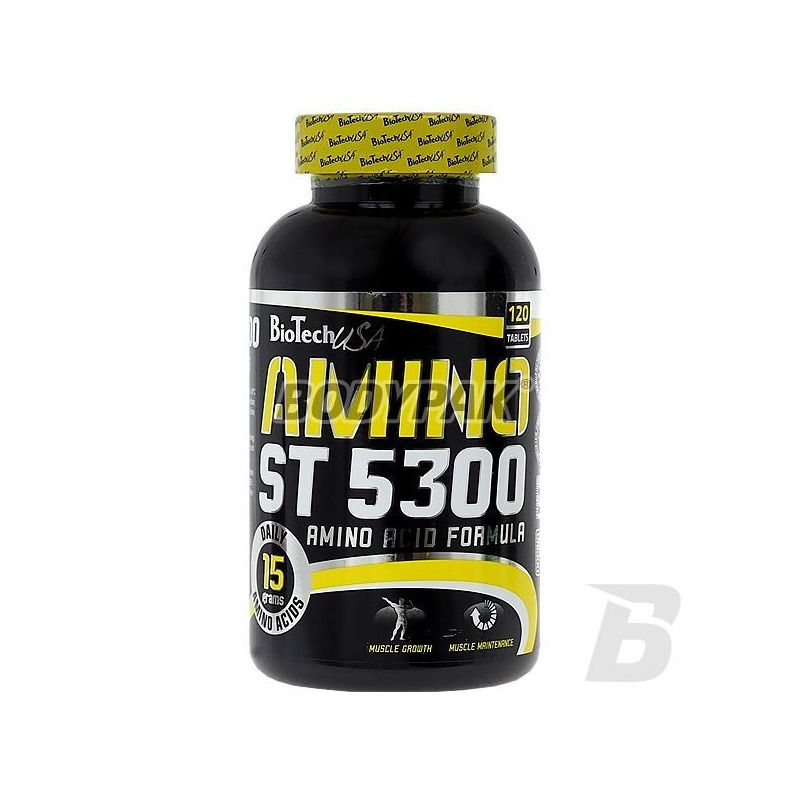 Amino AcidsBioTech Amino ST 5300 - 120 tabl. BioTech Amino ST 5300 - 120 tabl. Amino ST 5300 contains 100% pharmaceutically pure crystalline amino acids derived from egg whites and whey protein isolate. 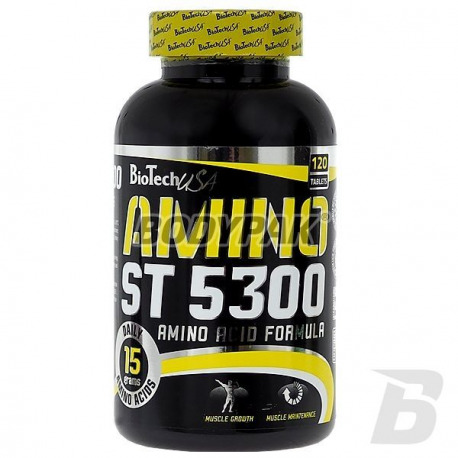 BioTech Amino ST 5300 - 350 tabl. Cutting-Edge Amino ST 5300 is engineered to contain all essential amino acids (EAAs), conditionally essential amino acids (CAAs) and non-essential amino acids (UAAs) as well as an extra dose of branched chain amino acids (BCAAs): leucine, isoleucine, and valine. Like all BioTech USA products, Amino ST 5300 consists of 100% safe and carefully selected ingredients. 15360 mg of aminos daily! Specifically developed for top athletes and competitive bodybuilders, a daily serving of Amino ST 5300 contains an incredible: 15360 mg of amino acids to help achieve professional fitness goals. Ingredients: Amino Acid Complex ( whey protein hydrolyzate , sodium caseinate isolate, GL max hydrolyzate, PS isolate), maltodextrin, anti-caking agent (E551, E553b, E470b), tablet coating substances (maltodextrin, E464, E1200, E553b , Medium chain triglycerides, E110 dye). Czyste aminy w tabletkach.. właśnie to sprawia, że ciągle wracam do tego preparatu. Jak tylko będzie promocja - bierzcie! BioTech Mega Amino 3200 - 100 tabl. Amix Free Form Leucine - 120 kaps. L-Leucine is the most important amino acid branched BCAA. Its main function is to reduce decay and intensification of reconstruction of proteins, improving nitrogen balance and the regulation of lipid and carbohydrate metabolism. It helps in improving the effects achieved!